terrorist "achieved the highest Martyrdom"
PA official Laila Ghannam, the District Governor of Ramallah and El-Bireh, praised the "Martyrdom-death" of a 17-year-old terrorist who was shot and killed while throwing Molotov cocktails at Jewish civilians. "Our child Martyrs, Allah willing, are birds in Paradise." Last year, Palestinian Media Watch documented the PA's similar glorification of teenage terrorists who missed their exams, saying their teenage Martyrdom was "the path to excellence" and "the great victory:"
Sixteen [students] succeeded [in achieving] the Martyrdom (Shahada)... for death as a Martyr is the path to excellence and greatness, and the path of those who know how to reach the great victory..."
Similarly, this year, the Ramallah governor "expressed her pride" over the "generations that are loyal to the path, and wished success to all of the high school graduates." PMW has demonstrated the effectiveness of the PA leadership's presentation of Martyrdom-death for Palestine as an ideal, which is striven for by Palestinian youth. Last month, a 23-year-old Palestinian sought Martyrdom because he believed he would marry 70 Virgins in Paradise. Last year at a matriculation ceremony, the PA Minister of Education similarly "honored the soul" of a student - the 19-year-old terrorist who murdered Israeli policewoman Hadar Cohen. Headline: "Mother of Martyr Hattab dreamed about a bird that told her of her Martyr son's success"
"Ramallah and El-Bireh District Governor Dr. Laila Ghannam expressed her pride over our generations that are loyal to the path, and wished success to all of the high school graduates. However, today [July 12, 2017] she preferred to visit the families of the child Martyrs (Shahids) who were supposed to take the high school matriculation exams this year - but the occupier's bullets separated them from their future and they were targeted in cold blood. Among these families was the family of the young Martyr Muhammad Hattab (i.e., terrorist, threw Molotov cocktails at Israeli civilians), 17, from the Jalazone refugee camp, who is called Abu Saleh, who ascended [to Heaven] as a Martyr this past March and joined a row of child Martyrs who were targeted by the occupation without any hindrance or deterrent. District Governor Ghannam visited the family of Martyr Abu Saleh today and noted that their son achieved the highest Martyrdom (i.e., word play, the Arabic word also means certificate as in matriculation certificate), and that the hearts of all the members of our people are turned towards their family and all of the families of the Martyrs, whose futures were stolen from them as a result of the occupation's actions, violence, and crimes. District Governor Ghannam gave [the family] a statuette of a bird and emphasized that our child Martyrs, Allah willing, are birds in Paradise. Parallel to this, last night the Martyr's mother dreamed of a bird that appeared on the horizon and told her about the results of her son, who was meant to be among those that excelled in the high school matriculation exams this year." 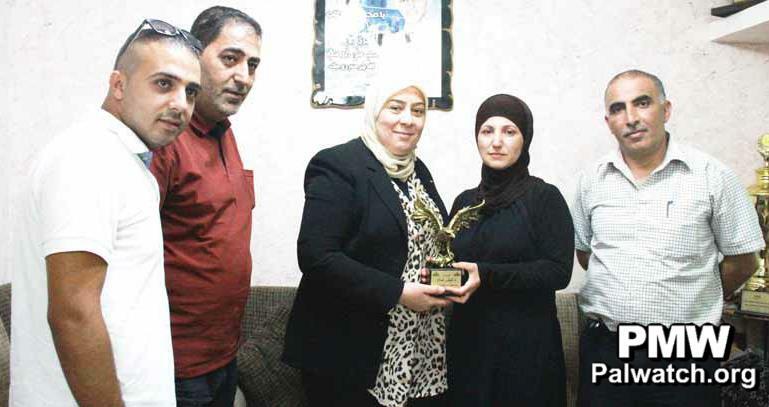 The article includes a picture of Ramallah and El-Bireh District Governor Laila Ghannam presenting a statuette of a bird to the family of terrorist Muhammad Hattab. Muhammad Hattab - 17-year-old Palestinian terrorist who was throwing Molotov cocktails at Israeli civilians at the entrance to the Jewish town of Beit El, near Ramallah, on March 23, 2017. Hattab was shot and killed by Israeli soldiers.